Thermal paste, the goop that helps keep our little monsters from overheating, is often overlooked in the pursuit of a better performing and/or quieter system. Even I, up until a few months ago, would rely on just the cheapest product to get the job done. Thermal Interface Material (TIM) is a critical component in any PC build. It helps fill up the microscopic holes, scratches and defects in both the processor heat-spreader and the heat-sink base. Without the paste, we would be relying on air to do this for us, and air is a relatively poor heat conductor. 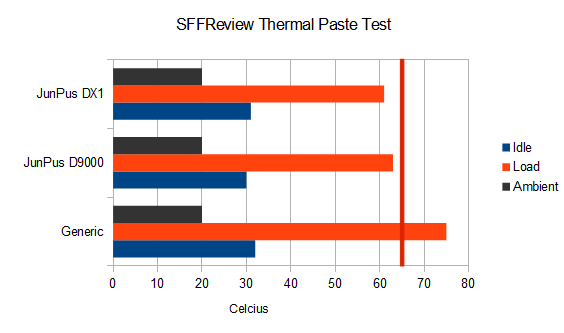 Without further ado, lets get in to the first round of SFFReview’s Thermal Paste Roundups! Ding Ding! All testing is performed in an open bench setup to reduce any effects of chassis cooling. This also enables the measured room ambient temperature to reflect the system ambient temperature more closely. Ambient temperature is taken during each test run and noted. Using Prime95’s ‘blend’ test, we load up all 4 CPU cores, giving us a maximum heat output of the processor. The test is run for 10 minutes, to allow the CPU, heatsink and TIM temperatures to stabilise. 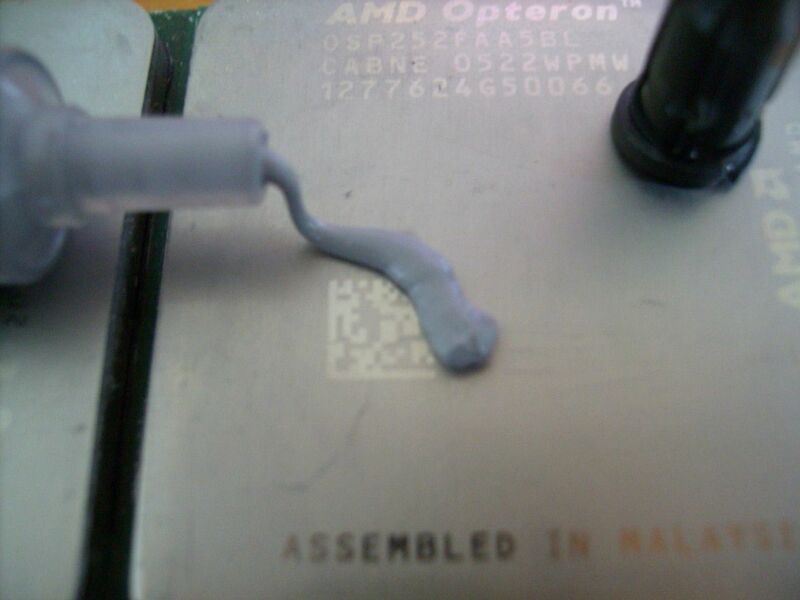 Application of the paste is by the ‘grain of rice’ method, which is an application of paste to the centre of the CPU heatspreader approx the size of a grain of rice. The heatsink is then applied, and the paste is spread across the heatspreader and heatsink base by the compression of the heatsink mounting. This is the paste available nearly everywhere PC parts are sold. This generic style product is usually found for a couple of dollars per tube. This tube was obtained from my local JayCar store for $7, and is a 1.5gm tube. The paste has a very thin consistency, and is easy to apply from the syringe. 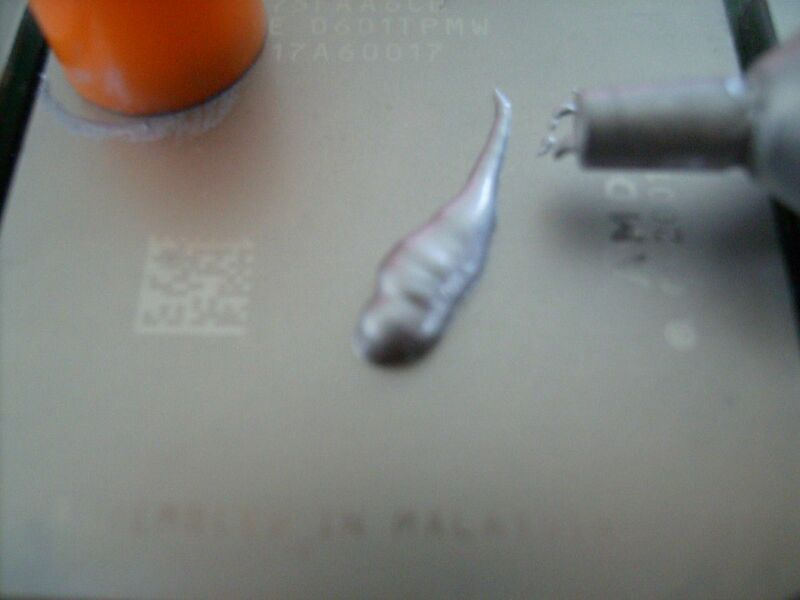 This paste is from a company you may not know of, but probably have used a product of theirs in the past – JunPus. They have provided pastes to various companies through OEM agreements in the past, and are now making a jump into the retail market. JunPus International Co., Ltd. is a leading Manufacturer, Supplier and Exporter ofThermal Compound, Thermal Compounds, Thermal Compound Paste with a factory in Taiwan. We supply and export consistently high class products and continually improve upon the manufacturing processes and work environment through total employee involvement and strict adherence to fair business ethics. We have gained several patents in the field. Our sincerity and hard work has helped us to match our quality with international standards. If you are interested in any styles of our products, please feel free to contact us. We are the leading manufacturer, supplier and exporter of which are engineered from the best quality raw material and are acknowledged for their sturdy construction and durable service life. During the manufacturing process, our expert teams checks the quality of the products thus we ensure the superior products to our clients. It is primarily used in the electronics and computer industries to assist a heat sink to draw heat away from a semiconductor component such as an integrated circuit or transistor. 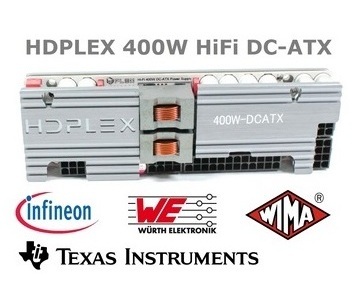 In electronics, it is often used to aid a component’s thermal dissipation via a heat sink. We are best known for satisfying customers with the efficiency and long last lasting ability of our products. 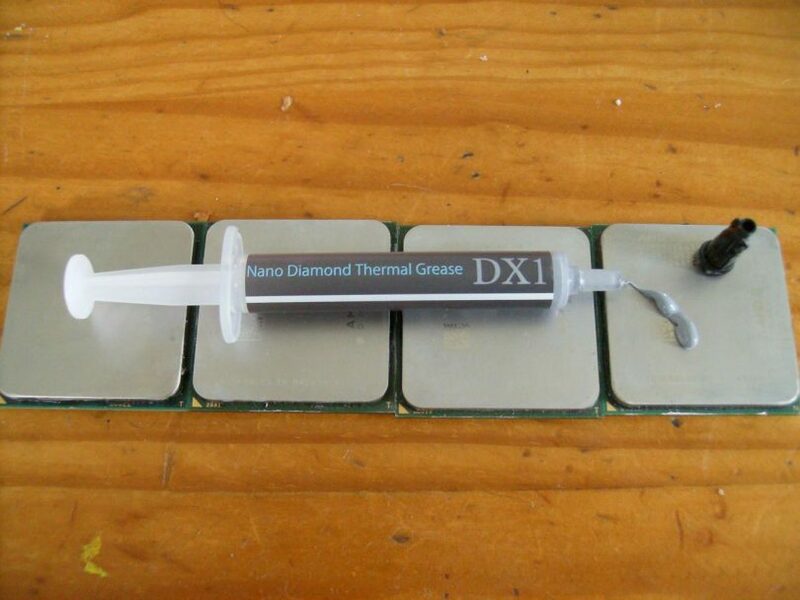 This paste makes use of nano-diamonds to achieve high thermal performance. We’ll have to see how this compares with the silver in the generic paste later on. The paste has a smooth, medium thickness consistency, and is easy to apply from the syringe. 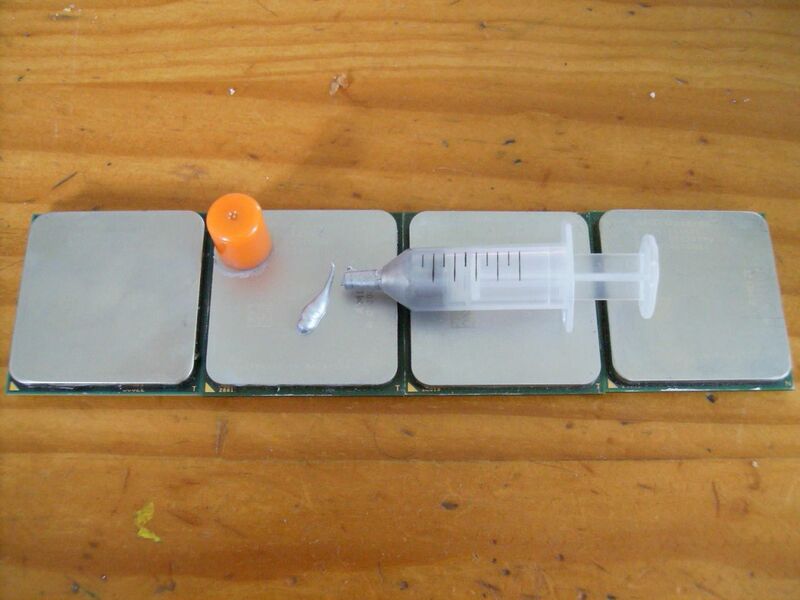 A second thermal paste from JunPus, this product also makes use of nano-diamonds to achieve thermal performance. The paste has a smooth, thick consistency, and is moderately easy to apply from the syringe. And the important details, the change in temperature over ambient. The JunPus products easily beat the generic offering here, showing a clear reduction in temperature of 12 degrees for the DX9000 and 14 degrees for the DX1. 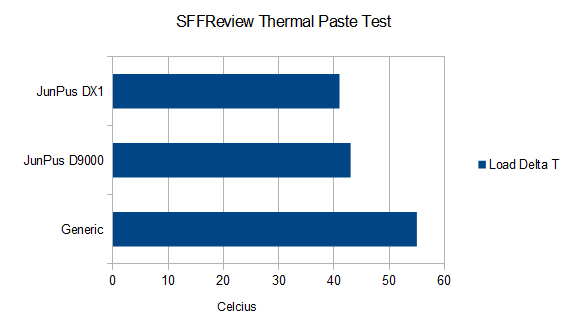 In today’s test, we’ve seen how much difference a quality paste can make on your CPU temperatures and system stability. Clearly, the outright winner here is the JunPus DX1 – showing excellent performance under a load condition well above what you would see in a SFF system. Close behind is the JunPus D9000, once again performing very well considering the conditions. We will bring more Thermal Paste Roundups as we get more samples to test in the future! Special thanks to JunPus International for providing the DX1 and D9000 products for review here. Check their range out at www.junpus.com!